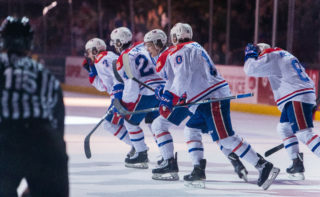 SPOKANE, Wash. — Ethan McIndoe had a career-high four points (2G-2A) and Los Angeles Kings prospect Jaret Anderson-Dolan scored his 100th career Western Hockey League goal on Friday night as the Spokane Chiefs defeated the Victoria Royals, 8-3. 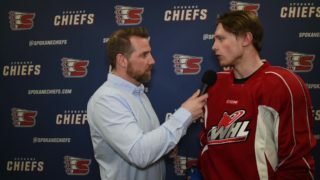 A high-scoring first period featuring six combined goals got started with a score from Chiefs forward Connor Gabruch, giving him points in three consecutive games and goals in two. 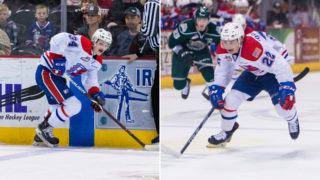 Victoria struck back with two goals before Anderson-Dolan joined the century club, sliding in the first of four power play goals for the Chiefs to tie the game at 2-2. After another Royals goal, Spokane overage forward Luc Smith added his 23rd of the year to make it 3-3 heading into the first intermission. The scoring cooled down in the second period as McIndoe scored his first of the night on a rebound for the period’s only score. The goal, scored at the 8:55 mark, proved to be the game-winner down the stretch. 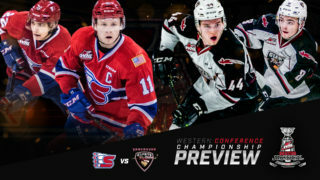 Spokane pulled away in a dominant and decisive third period as they outshot the Royals 21-8, scoring four goals and holding Victoria off the board. Jake McGrew, Nolan Reid and Luke Toporowski scored goals, joined by McIndoe’s second of the night. 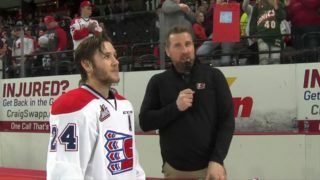 Bailey Brkin collected the win for the Chiefs in goal as he went 28-for-31 in the full 60 minutes. Victoria’s Griffen Outhouse started and finished 41-for-48 in 59:37. Brock Gould relieved Outhouse briefly in the third period, allowing one goal on one shot in 23 seconds. The Chiefs finished the night 4-for-8 on the power play and 3-for-4 on the penalty kill. The Chiefs take to the ice again Saturday night when the face the Kootenay ICE on Centennial Hotel Buck Night, meaning fans can purchase $1 hot dog and Coca-Cola beverages at various concession stands throughout the concourse. 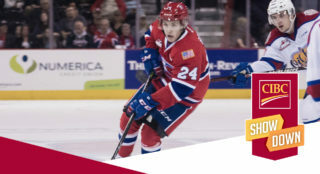 Fans will also be invited to stick around following the game to obtain signatures from some of their favorite Chiefs players at the the Itron Postgame Autograph Session!